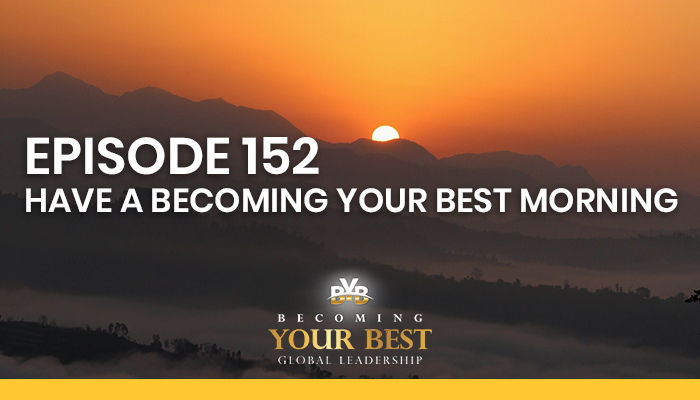 Welcome to our Becoming Your Best podcast listeners wherever you might be in the world today. It is a delight to be together with you. This is Steve Shallenberger your host and we are going to talk today about an exciting, invigorating subject. It is, how to have a becoming your best morning. Now, this has been as good for me as anybody else, I guarantee you. I hope you likewise enjoy it. It’s really interesting as we think about this. As we think, well, what’s involved in a becoming your best morning? How long does it take? It starts when you get up. Actually, it probably starts the night before, but it takes 30 to 60 minutes. And you might say, “Woah, that seems like a lot.” But when you really reflect upon how much time that is, that’s out of 1440 minutes in a day that we have. Or in other words, we’re taking just 2% to 4% of our day to create a highly successful day. A day that you feel excited about, you feel satisfied about and it brings happiness and joy of accomplishment. This little process of becoming your best morning is the foundation of helping you become your best each and every day. And it gets you off on the right foot for a great day. We’re really talking about setting a routine, an exciting routine. Not just something that’s mundane for you, and you can find an order that works best for you and then let it contribute to your health and success each and every day. So there are seven parts to having a becoming your best morning and let’s just talk about those seven parts and then we’ll go over each one. Step number one is to get, it starts the night before, get seven to eight hours of sleep and rise before the sun. Number two is, immediately drink at least 16 ounces of water with a lemon and really stay hydrated. We’ll talk about why and the research behind some of these. Number three is to quietly center yourself. Review your pre-week and daily plan, and we’ll get into what that entails but really get centered. Number four is to stretch. Number five is to exercise. And number six, take a few minutes to focus on your affirmations to really put yourself in a positive frame of mind. And number seven, don’t look at your phone or check your email first thing. So there you go. Those are the seven things. So let’s jump right into these and start off with number one. Get seven to eight hours of sleep and rise before the sun. Now, what’s really interesting about this is statistics show that 4% of humanity can make it on four hours sleep. It’s just kind of in their DNA. They’re engineered that way and they wake up rested. I’m not one of those. If the rest of the 96% of humanity try to make it on four hours sleep, they are going to pay a price. So when you don’t have enough sleep and you end up with sleep deprivation, it can have multiple negative impacts on you, including contributing to chronic health problems, depression, exhaustion, increased risk of accidents, impaired cognitive abilities, bags under your eyes, headaches etc. Can any of you relate to any of those? Well, take time to recognize these danger signs to your body and make it a priority to take corrective action and make regular healthy sleep a priority. That is really vital for our success and health. To pave the way for better sleep, here are a few simple yet really effective healthy sleep tips. So those include stick to a sleep schedule, even on your weekends where possible. Sometimes I travel. That’s a little hard, but I try to stay on a regular sleep schedule that’s predictable for me and my body can count on. Practice a relaxing bedtime ritual, whatever that might be. Of course, we’re going to talk about this other one, exercise daily. These things help get your body into a groove of good health practices. Evaluate your bedroom to be sure it’s conducive to sleep. So ensure ideal temperatures, sound, light, etc. And then sleep on a comfortable mattress and pillows. I mean, if your pillow is causing you to really put your neck in a bad position, that’s not going to work. You’re going to be uncomfortable and tossing all night. Be aware of hidden sleep stealers. Caffeine. I have a friend of mine, Dr. Mao that suggests that don’t drink any liquids three hours before going to sleep. This helps your body settle down. Fast 12 hours from your evening meal to your breakfast meal. This gives your body a chance to reset. Digestion is a huge stress on the body. So these are a few things that can really steal your sleep away. But by just managing a couple of those simple things that is helpful, and certainly turn off your electronics before bed. I have a friend that as we were talking about this whole thing he said, “You know, I’ve kept my phone right next to the bed. It’s a killer. I hear it going off during the night and occasionally I’ll get a call.” So just settle everything down the night before. Clear any important calls that you need to make in advance. And then be sure that your electronics are not near where you’re sleeping. If you feel that there’s going to be some type of an emergency that’s on the on the cusp out there, then try to make arrangements for it. But otherwise, arrange so that you can have a peaceful sleep and that electronics aren’t part of it. So I think if you or your family members are experiencing symptoms, such as sleeplessness during the day or when you expect to be awake or you might have snoring or leg cramps, other symptoms that are preventing you from sleeping well, you should consult your primary care physician. There are things that you can do to help some of these things that are more chronic. In other words, we’re setting ourselves up overall to really get seven to eight hours of sleep. It’s going to be different for every person. If it’s a baby or a toddler or a teen we’re talking about, they need more sleep. So it really varies as we go through life but that’s a good rule of thumb. You’ll figure this out for yourself. That’s number one. Number two, immediately drink, well, at least 16 ounces plus of water with lemon and just stay hydrated. Your body contains more water than anything else. It’s about 60% of your total body weight. Water helps regulate our body temperature, transports nutrients, helps remove waste and every day, we’re losing water from a number of different reasons from breathing, sweating, waste, etc., and so it really needs to be replenished. The question is, well, how much water do we need to drink? Although that’s a kind of a simple question, it doesn’t really have an easy answer because it really depends on environmental issues, physical factors that can change every day. It’s not just the water you drink, it’s about 20% of your water intake comes from foods that you eat. The remaining 80% comes from beverages, including water, and anything else, any other liquid. So it’s interesting, the Institute of Medicine of the National Academy reviewed years of research evidence based on adequate water intake and here are some general guidelines. Men, maybe about 10 cups of water from beverages per day. Women, perhaps nine cups of water. That would be seven cups from beverages. So you’re going to have other things that come along. Pregnant women, about eight cups from beverages, 10 cups overall. And breastfeeding women, 13 cups. That’s again about 10 cups from beverages. It just gives you a general thought. Now, we said adding lemon. This is not really a footnote at all. This is an important combination of what you’re drinking. Adding lemon to your water affects your overall health, from boosting the digestive system, immunity, to encouraging natural cleansing. So not only that, but a simple squeeze of a fresh lemon is jam packed with potassium, vitamin B and C, calcium, magnesium, antioxidants and iron. These contribute to greater health. They help diminish inflammation. In fact, research studies conducted by Ohio State University linked lemon juice and lemon oil aroma to positive physical and emotional effects on the brain. So for instance, inhaling the scent of lemon increased all kinds of healthy things going on. And so it’s a feel good chemical that releases into the neurotransmitters which significantly boosted energy and alertness, as well as brain functioning, mental alertness and the general ability to focus. Also lemon, along with plenty of water, helps reduce urinary tract infections. Lemon is a natural breath freshener and leads to healthier, cleaner skin. So it’s really interesting as you look at the different impacts, they’re quite significant. All right, that’s number two. Number three. Quietly center yourself. Review your pre-week plan and your daily plan. Just look at it and quietly ponder and reflect on what’s happening and get it settled so that you attack these things with a sense of confidence and peace and you’re directed of doing the right things. Ask yourself what can you do? What key actions can you take today that will make it a great day? Some of our listeners have heard us talk about chair flying. I love chair flying. Once you have your plan in front of you, you can close your eyes and just see yourself going through the day, making great decisions and seeing crisis and torpedoes in your day blowing up and you responding really wonderfully like a master leader of being in control, even though we’re not always in control, but of moving things around so that we stay generally on track. Consider the things you’re grateful for. This is so powerful, having gratitude and expressing gratitude enlarges literally your soul and your spirit. Express thanks in prayer. These are all things that quiet us down and give us great internal strength. So regardless of what the weather is like outside, you carry your own weather inside which is extremely powerful. Feel the power of peace and love and gratitude and focus. These things give us greater capacity as we deal with others, in our relationships, stressful work situations, and put us in a better position to succeed today. Number four is to take time to stretch. Take a few minutes for some form of yoga, ergonomics and meditation. These really help. They reduce the risk of strained muscles and damaging body parts as you’re moving throughout the day. Very helpful. Number five is to exercise. Even walking one mile a day is crazy healthy. It’s amazing. I had the opportunity, and some may have heard this, when we were in Singapore earlier this year, of going to a session and meeting. Dr. Fotuhi, he talked about longevity and health. And actually had a brain there and showed us where the cortex was, the wavy part on the outside of the brain responsible for the long term memory. And then deep down in the inner part of the brain is the hippocampus. He said, This is the gateway to longevity and health, body health, brain health. He said, When you turn 50, the hippocampus actually shrinks 0.05% per year, and the size of the hippocampus is what determines your health. He said, So the smaller it becomes, the more at risk that you are and the shorter the lifespan. He said, That’s even impacted more heavily if you have diabetes, traumas, high stress, lack of sleep. There are certain things that…Obesity…That really cause this hippocampus to even shrink more quickly. He also pointed out there are certain things that you can do that once you turn 50, you can actually grow your hippocampus. One of those was exercise. As a matter of fact, walking one mile three times a week can grow your hippocampus 23%. I was blown away by that, astounded. So having just regular exercise really is transformational for you physically. And it comes together with these other thing. It doesn’t have to take long, does it? Personally I tried to, over the years…Dr. Oz is another one I had the chance to be together with this year. One of the things when he was talking about having a healthy diet in regards to longevity and health, he said, “Have a diet that you love.” In other words, enjoy the food so that you can sustain your diet. I think I would say the same thing about exercise. Have exercise even though it may not be always pleasant to do. Have an exercise that you like or even love. That you like what it does to your body and the end result. So I have found a few that really work for me. Certainly, one of those is walking. I enjoy walking. I might do an occasional jog, but I enjoy walking. During the good weather I go outside and during the bad weather, we have a mall that’s reasonably close and we can walk there. It’s easy, it’s warm. And so you’re not subject to the conditions of the weather. So I, together with my wife, will walk two or three times a week. We walk one to two miles depending on how my schedule is, how we’re feeling. One of my good friends is Ron Williams. Ron is a former seven time Mr. Universe, Mr. Natural Universe. He’s an amazing person as well, but he helped me really learn some great health practices. One of those is he has the Ron Williams Burn and Churn Workout. You can actually see it on YouTube. I do that one a couple of times a week since it’s a 45 minute one. So I really plan it out in advance, I know what’s coming. But it works all parts of my body. And then the last one, I have a good friend by the name of Steve Price. Steve turned me on to a stationary bike called the peloton. It’s a virtual riding bike that links you with other riders all over the world. You can either do a live training or do one that’s past, but it links right in. It tells you where you’re at, it ranks you against them but also your previous rides. You can take scenic rides. Well, I do that one once or twice a week. So that’s my combination. At the beginning of the week when I do pre-week planning, I’ll actually sketch those out. And so each day, when I work on having a becoming your best morning, I have one of these exercise modalities in mind and that’s the one I do. It is such an energizing time. If I’m out walking by myself, I always take something to listen to. Something that stimulates my mind. It might be a talk, a TED talk, or a clip of something. It could be invigorating music. That’s number five, is exercise. Number six is take a minute to focus on your affirmations. People often say, well, where are my affirmations? Well, they can be contained in your personal vision and they reaffirm what you’re like. So for example, today will be a great day. I will treat all people I know with love in my heart. These are affirmations. They affirm how you choose to believe. And so what are you going to do today to make them a reality? Indeed, what you’re really doing is creating and maintaining a positive frame of mind, and when you have this positive frame of mind, it changes everything, especially in contrast to having a negative frame of mind. So what you really want to do is cast out all negative thoughts. Just be determined, they’re not going to be part of your life. It doesn’t mean they don’t happen, because they certainly do in life, but be determined that you are going to just be sure you’re in a positive frame of mind that you’ll maintain throughout the day. There’s some real strong research that supports this type of approach. The top 25% of optimistic people had 39% less risk of heart disease or stroke, and a 52% less risk of dying from an infection. I mean, that’s powerful information. And optimistic sales reps sell 56% more than their pessimistic peers. In a study of chronic complainers, they found that the hippocampus actually shrinks and that their significantly higher cortisol levels which leads to increased risk of heart disease and diabetes. So this is pretty powerful information in terms of the frame of reference that we have in creating a positive frame of mind that carries into a successful day. I’m just telling you right now, if you have a successful morning, a becoming your best type successful morning, it leads to a successful day very directly. It’s interesting. Well, while we may want to be responsible and stay abreast of important emails and information on our devices, let’s just be sure to use our devices when we’re in the right mindset to have a great day and be focused on dealing with the needed communication in what matters most. What things that really count most and that are at hand. This type of information, leadership and management helps to put you in the driver’s seat of being highly productive and having a great day, really every day and it’s nearly impossible to turn on the TV, open up a web browser, scroll through your device, whatever the medium might be, without being assaulted with notification of a new world disaster or two or three. Thanks to the 24 hour news cycle, alerts of shootings or plane crashes, unfortunately, beheadings and crime and war and human rights violation are absolutely nonstop and constant. And this incessant news of violence and destruction may be really messing with our heads. It just doesn’t help us to get to a right place. Well, the fact is, the world isn’t falling apart. Bad things happen, but it can sure feel like it is. And so the news can be really violent, depressing and emotionally charged and that is why we need to take charge, to put this in the right order and certainly not start off our day with that type of an influence in our lives. So, those are seven things that you and I can do to really have a becoming your best morning which leads to a becoming your best day. Let’s just review these seven things that you can do to have that kind of a morning and a day. Number one is get seven to eight hours of sleep. If you’re one of the lucky 4%, more power to you, that’s great but be sure to rise before the sun. Early to bed, early to rise, goes the old saying. Number two, immediately drink, or at least sometime in the first 10 or 15 minutes, 16 ounces plus of water with a lemon and stay hydrated. Number three, quietly center yourself, review your pre-week and daily plan. Ask yourself, what can I do to make it a great day? Consider the things that you’re grateful for and express thanks and prayer and feel this power of peace and love and gratitude and focus as you kick off your day. Number four, take time to stretch. Just take a few minutes. It’s amazing. I’ve already done that part, and by the way, my exercise is coming right after this podcast today. I’ve already done most of these but exercise is next. It’s still pretty early in the morning. Number five is to exercise. Number six, take a few minutes to focus on your affirmations. What are you going to do today to make them a reality? And especially create a positive frame of mind. Number seven is don’t look at your phone, your device or check emails first thing. Wait until you’re in the right frame of mind to do so. Imagine the impact that this is going to have on your life, on the life of those that you associate with as you carry out your various responsibilities. Well, this has been so wonderful to visit together. I wish that we could just be here right together. Remember, every single day as you work on these kind of things, you’re making a difference and it’s worth it. Every single day is worth making the best out of life. So I wish you the best in that wonderful adventure and I’m signing off today wishing you a becoming your best day.